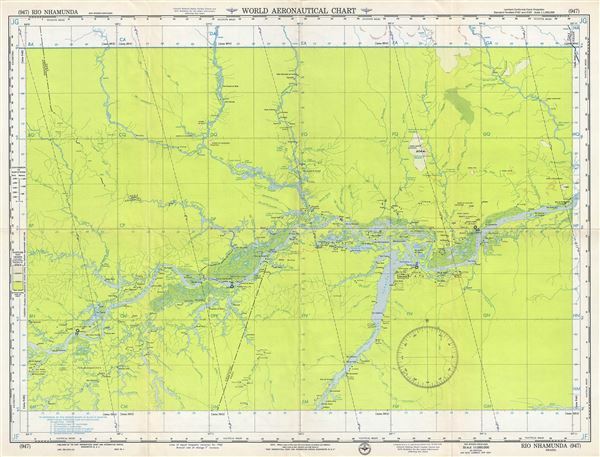 This is a fine 1954 U.S. Air Force aeronautical chart or map of the Rio Nhamunda, a tributary of the Trumpets River in northern Brazil. The chart covers the region from Apere south to Pedreira and from Casa Perere east to Ilha do Paranaquara. The towns of Itacoatiara, Parintins, Santarem, Juruti, etc. are noted. The map is highly detailed and notes several rivers, marshes, towns, lakes and other hydrographical and topographical features essential for the air pilot. Verso of this chart features legends and a world aeronautical chart index. This chart was published by the USAF Aeronautical Chart and Information Service, and was issued as chart no. 947. First issued in 1950, this is the fourth edition revised to April 1954.